Hope you all had a great weekend! I caught up with lots of friends this weekend and then spent today doing lots of food prep and catching up on the Bachelor. I’m so excited for one of my friends who lives out of state to visit this week and bring her new baby girl. 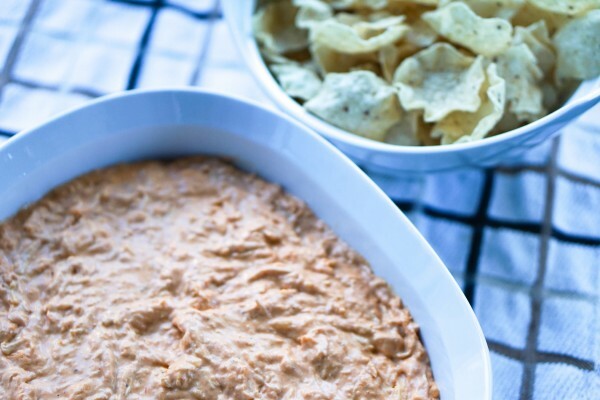 I’m planning on serving a bunch of dips and easy appetizers, so today I made one of my favorites, a light version of buffalo chicken dip. Then when my guests arrive, I’ll pop it in the oven and it will be good to go with tortilla chips! The best part about this dip is there are lots of different ways to customize it based on your preferences. The recipe below combines a few different recipes that friends and family have shared, and it’s super easy, especially if you prep your cooked chicken in the slow cooker. Just throw a couple chicken breasts into your slow cooker on high for 3 1/2-4 hours and it will shred nicely. The key with this recipe is to put the chicken in the buffalo sauce before adding the ingredients. I’ve also included some other ways to make it at the bottom – feel free to make it however you want! Heat chicken and hot sauce over stove on medium until chicken is thoroughly soaked. Add ranch dressing, sour cream and shredded cheese. Stir until blended. Pour into square baking dish (optional: add bread crumbs and more shredded cheese). Bake at 350 degrees for at least 20 minutes. Serve with Tostidos or pita chips. What’s your favorite dip recipe? Share it below!